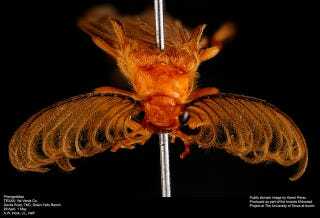 These enormous antennae are for more than just show. The male glowworm beetle needs them if he’s going to track down a female. It’s not that lady glowworms are shy, they can’t go looking for males. They have no wings. Thus, glowworm courtship looks a little like this: a lady looking for love throws specific chemical invitations into the air, pheromones indicating she’s available. Males from far and wide pick up the signal: their feathery antennae slow down the air passing through the frilly branches, giving any pheromone molecules wafting by time to stick. A lucky glowworm dude will follow the chemical trail until he reaches its source. There, he’ll find the soft green glow of his intended. It’s not that different from Tinder, really.